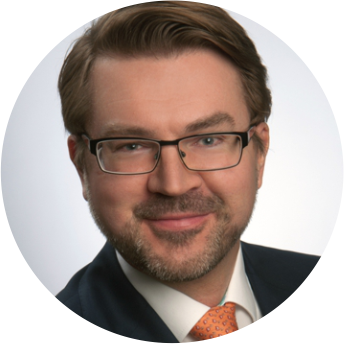 Martin has extensive experience in financial products, including derivatives and ETFs as well as cross-asset portfolio management and holistic client advisory. Over the years, he became an internationally recognized publisher and expert (quoted in Politico, Bloomberg Brief, Handelsblatt, Finanz und Wirtschaft etc.). He started his career in 1996 with a bank apprenticeship. After positions in institutional asset management, Martin became part of a newly formed JV between State Street and PIMCO. His responsibility was for flagship funds, investing into structured bonds and complex derivatives. Afterwards, he continued his career working as New Products/New Markets Executive for BayernLB. Since 2010, Martin is managing Switzerland's leading investor magazine as Executive Director. Martin has been appointed Senior Advisor to the Board of MYRA Capital AG, mainly responsible for cross- border projects, together with the New York Stock Exchange. As Founding Partner of two U.S. financial companies, Martin has been actively involved in the transatlantic business. His profile is completed by a Bachelor in B.A. (Faculty Degree, TU Munich) and a diploma as a Chartered Alternative Investment Analyst. "It's crucial for today's investors to know about Exchange Traded Products. We provide insights how to build and steer a portfolio successfully. All written in an easy to understand way." Publishing rights by John Wiley & Sons, Inc., or related companies. ©2017 Beyond Smart Beta Advisory Group. All rights reserved.